The purpose of this study was to determine the utility of fat-suppressed gradient-recalled echo (GRE) compared with conventional spin echo T1-weighted (T1W) sequences in direct shoulder MR arthrography for evaluating labral tears. 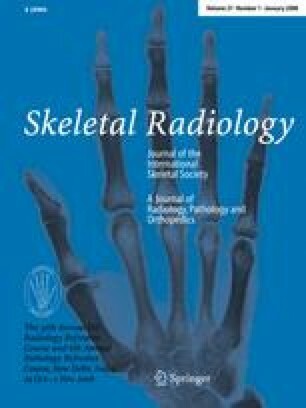 Three musculoskeletal radiologists retrospectively reviewed MR arthrograms performed over a 12-month period for which surgical correlation was available. Of 180 serial arthrograms, 31 patients had surgery with a mean of 48 days following imaging. Paired coronal oblique and axial T1W or GRE sequences were analyzed by consensus for labral tear (coronal oblique two-dimensional multi-echo data image combination, 2D MEDIC; and axial three-dimensional double-echo steady-state, 3D DESS; Siemens MAGNETOM Sonata 1.5-T MR system). Interpretations were correlated with operative reports. Of 31 shoulders, 25 had labral tears at surgery. The GRE sequences depicted labral tears in 22, while T1W images depicted tears in 16 (sensitivity 88% versus 64%; p < 0.05). Subdividing the labrum, GRE was significantly more sensitive for the posterior labrum (75% versus 25%; p < 0.05) with a trend toward greater sensitivity at the anterior labrum (78% versus 56%; p = 0.157) but not significantly different for the superior labrum (50% versus 57%; p > 0.7). Specificities were somewhat lower for GRE. Thin section GRE sequences are more sensitive than T1W for the detection of anterior and posterior labral tears. As the specificity of GRE was lower, it should be considered as an adjunctive imaging sequence that may improve depiction of labral tears, particularly smaller tears, in routine MR arthrography protocols. Preliminary results of this study were presented at the Annual Meeting of the Society of Skeletal Radiology, Orlando, FL, USA, on 21 March 2007. We thank James Sayre, PhD for advice and assistance with the statistical analysis.